The dynamic propagation of an earthquake rupture will generate inelastic deformation within its surrounding medium, culminating in the development of a fault damage zone. These are heavily fractured volumes of rock that flank the fault core, where the majority of displacement has been accommodated. Using the example of the Alpine Fault, I assess the mechanical and chemical processes associated with fault damage, which strongly condition the short and long term evolution of a fault. Approximately 70% of the oblique-dextral motion between the Australian and Pacific plates on the South Island of New Zealand is localised onto the Alpine Fault. A continuous record of its damage zone extending <30 m above its principal slip zones (PSZs) is provided by core recovered during the first phase of the Deep Fault Drilling Project (DFDP-1). A combination of visual core descriptions, X-ray and neutron tomographic core scanning, and X-ray diffraction demonstrate that the damage zone is epitomised by gouge-filled ‘phyllosilicate-enriched’ fractures. These contain a soft fine-grained fill, which have a relatively low density but are hydrogen-rich. Their bulk composition reflects both wear of the surrounding rock and phyllosilicate mineralisation during hydrothermal alteration. Fracture density in DFDP-1 core and field transects does not increase with proximity to the PSZs, but does systematically vary with lithology. By reorienting core sections with respect to geographically referenced borehole televiewer logs of the DFDP-1 boreholes, the true orientations of 637 fractures was obtained. Combined with field observations, these results indicate that damage zone fractures occupy a wide range of orientations. This reflects variable stress states adjacent to the Alpine Fault, which are generated by a fault trace that is non-planar in the near-surface, and non-optimally orientated with respect to the regional stresses at depth. The mechanical anisotropy of the foliated mylonites that host the damage zone cannot strongly influence fracturing. In field transects, broadly-oriented fractures are confined to within 50-150 m of the Alpine Fault, and this is the best estimate of damage zone width along its central section. This width is comparable to elsewhere along-strike. Therefore, the Alpine Fault is considered to be embedded within a tabular localised damage zone, as documented in other structurally mature crustal-scale faults. Petrological and scanning electron microscopy demonstrate that gouge-filled fractures extend to the micron scale where calcite, chlorite, K-feldspar and muscovite veins are also present. These veins and fractures form in a cyclic manner that may be operative throughout the Alpine Fault’s seismogenic zone. The documentation of some veins that cross-cut cataclasite textures requires that strain localisation from the 10-20 m thick Alpine Fault cataclasites to its 10-50 cm thick PSZ gouges must occur at depths <2-5 km. This study has sampled the Alpine Fault damage zone late in its cycle of stress accumulation. Within this period, micro and macro-scale fracture healing has occurred at distances <25 m of the PSZs. A combination of fluid over-pressures and unhealed damage elsewhere permit a Low Velocity Zone around the Alpine Fault. 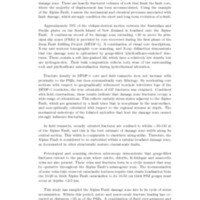 Williams, Jack Nicholas (Jack), “The damage zone of New Zealand,” Otago Geology Theses, accessed April 22, 2019, http://theses.otagogeology.org.nz/items/show/659.